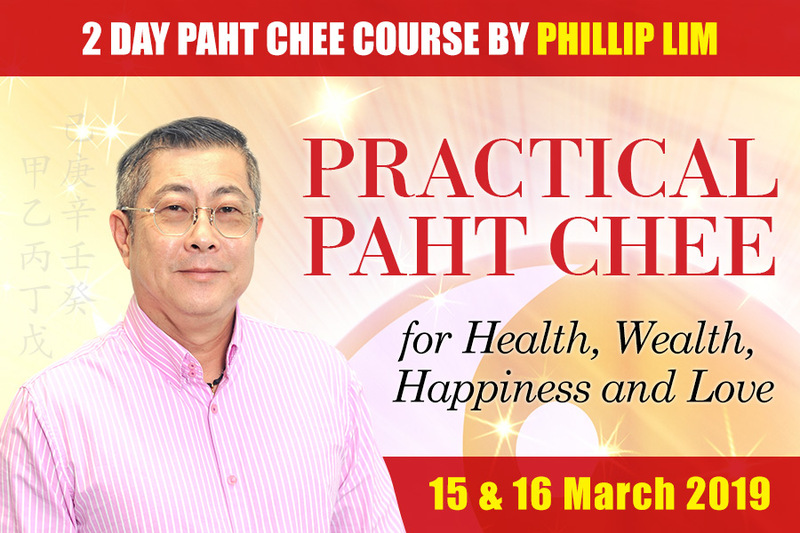 Our Resident Paht Chee Expert Mr Phillip will be conducting a 2 day course on the Practical applications of Paht Chee to bring you Better Health, Improved Wealth and Enhanced Happiness & Love at our office in Northpoint Offices, Kuala Lumpur on the 15th of March 2019. His simplified and practical approach to this ancient Chinese science of fortune telling will equip you with the know how to understand why do certain things happen in your life as well as a predictive module on how can you identify your lucky periods as well as times when you need to lie low to reduce your risk exposure. In this 2 days you will learn how to identify and correct afflictions in your birth chart including secret methods of enhancing your health wealth and happiness & love. There are no pre-requisites to attend this course, however some fundamental knowledge of feng shui would be helpful. Mr Phillip’s easy to understand English and method of engaging with students will ensure that everyone will fully understand the important aspects of this course and be able to walk away with usable knowledge on how to use Paht Chee for the betterment of their lives. Student’s own birth charts (minus the birth dates) will be analysed and discussed in the course of the seminar and used as examples for better understanding. This provides better understanding of the methodology used when analyzing the charts. Remedies for all afflictions found in their charts will be discussed on how best to correct, as well as methods of luck enhancement. If time permits, Mr Phillip will also share his method of date selection for important events such as moving house, weddings, renovation, start work and so forth. I am interested to know that there are always solutions to challenges. My interest in Feng Shui and the desire to help others brought me to this subject. I can analyse and understand my personal Paht Chee and of my family as well – learning on the solutions to areas of concern. I like Phillip’s way of sharing and patience in answering questions, and I like his approach – straight forward, simple and easy to understand, his stories’ sharing of examples so that we connect to the subject better. Thank you for having this course! I attended Lillian Too’s Master Practitioners Course in year 2003, to practice Feng Shui for my new house. I wish to know and analyse my own Paht Chee Chart, attaining a Life Skill and introduce my two boys to this subject, they are attending this course with me. The subject covered is comprehensive and relevant with personal references we can relate to. Phillip is willing to impart his knowledge, he is friendly and practical. This course is a very good introduction to Paht Chee practices. I have always find Paht Chee and Feng Shui interesting and would like to know if there are ways to improve life. I learnt about this course through Meggie who has been a great follower of Lillian Too. This course provides foundation to us in understanding Paht Chee and instill interest for learning Paht Chee in a more detailed manner. Phillip’s approach is good – interesting and practical. Training is interesting, practical and easy to understand although I need time to practice and catch up and familiarize with the various elements analysis, conflicts and etc. Overall I find the training good. Course venue, practical arrangements including access card granting, guidance & help with general matters, quality of food are good. What sparked my interest on this subject is I wish to learn what can improve quality in life, to remove and avoid obstacles. After attended this class, I have better understanding and knowledge to start practice my own Paht Chee analysis. This course is crucial to the practice of Paht Chee Anaylysis, provides basic fundamental and introduction. I like Phillip’s interactive approach. I will recommend this course to my friends who are interested with this subject. Phillip’s approach to this subject is good! I like the subjects taught in this class and the practical exercises. I am interested to see my Paht Chee and see whether I can make any changes to improve my life. My mum is great Feng Shui Follower of Lillian Too. I always use mystic knot to find parking anywhere. I like all the subjects covered in this class and Phillip’s teaching – good, clear and straight to the point. This course is very crucial to the practice of Paht Chee Analysis, provides a strong understanding foundation. I am interested to pursue on this subject to predict and foresee my involvement in this industry. My mum is great follower of Lillian Too’s teaching. The results of Paht Chee analysis of my family member is most accurate. I like Phillip’s clear explanation especially to our questions, I like Phillip’s approach on this subject very much! This course provides basic fundamental to the practice of Paht Chee Analysis. Please email Connie at courses@wofs.com for more details. Please fill up the form below for detailed course itinerary, courses fees and registration form.